Subscribe for a regular e-mail with free exclusive content. The Charisma Training Academy is over 25 hours of content from some of the worlds leading experts in charisma, communication, leadership, public speaking and storytelling. It is an entire membership programme that will teach you all you need to know to make a real impact with others. In this course, you will get access to everything you need to manage your time and become more productive. With these videos and audio files within, you will learn how to transform the way you manage your life and master the art of planning, prioritising and organising your life. In this 3 day event, you will get the opportunity to dive even deeper into the essence of charisma and communicating with impact. Owen returns with his most advanced charisma workshop to date. Prepare for an intensive, fun and jam packed three days where you will learn more about yourself, how you perform at your best and how you can make a real impact when you communicate. This three day course will help you to master the arts of influence, negotiation and motivation. From the fields of applied psychology, neuro-linguistic programming, behavioural economics and neuro-marketing comes cutting edge secrets and the greatest insights out there into how to get people to say YES. In this exciting seminar, Owen explains what his research and work over the last twenty years has helped him discover... the true keys to charisma. You will learn what you can do to boost your confidence and maximise your impact as a communicator and as a leader. 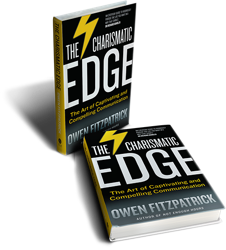 The Charismatic Edge is Owen Fitzpatrick's latest book. In it, Owen shares the keys to becoming a confident, compelling and captivating communicator. You have the chance to dramatically improve how you impact others through the many skills contained inside this book. In his book, Owen shows how you can take control of your life so that you make the most of every second. Inspiring and easy-to-read, this fable recreates the experience of being at a workshop with Bandler. This inspirational book gives you the tools to change your life and to overcome the things that are holding you back. Written in the form of a fable, How To Take Charge Of Your Life is the prequel to The Ultimate Introduction to NLP. Based around a three-day introductory course, this book will give you the tools you need to start making an effective change today. Conversations with Richard Bandler recounts Owen Fitzpatrick's journey with his mentor, Richard Bandler, and drawing on his own personal and professional adventures across the world, he takes you on a thought-provoking voyage of discovery. Memories is one of the most eagerly anticipated books in the NLP world. It follows on from Conversations where Owen Fitzpatrick sat down with Dr Richard Bandler, co-creator of NLP, and asked him questions about everything to do with life. Memories explores the philosophies of Richard and Owen and how they evolved over time. Lovin your Life is a powerful hypnotic CD designed to get you to appreciate your life in a deeper and more fulfilling way while falling more in love with your future. This hypnotic CD is designed to ensure that you are able to access a state of high performance whenever you need to, easily. This hypnotic CD is designed to help you to feel confident, calm and collected enough to handle any situation.